Ealaín Rang a hAon, ag péinteáil le uiscedhathanna i Seomra D. First Class Art, painting using watercolours in Seomra D.
Rinne Rang a hAon pictiúir álainne bunaithe ar obair cháiliúil Kandinsky. First class made some beautiful pictures inspired by the famous artwork of Kandinsky. Tháining Geoff Hunt ar cuairt chuig Rang a hAon. Bhailaíomar a lán rudaí suimiúla sa gháirdín scoile! Geoff Hunt came to visit Rang a hAon. We collected lots of interesting things in the school garden! Athbhliain faoi mhaise daoibh go léir ó rang a dó agus múinteoir Laura! Happy New Year from second class (seomra 2) and múinteoir Laura! Bhain rang a dó an taitneamh as siúlóid nadúrtha. Chuamar go dtí an clós súgartha freisin le múinteoir Laura agus múinteoir Mary Jo. 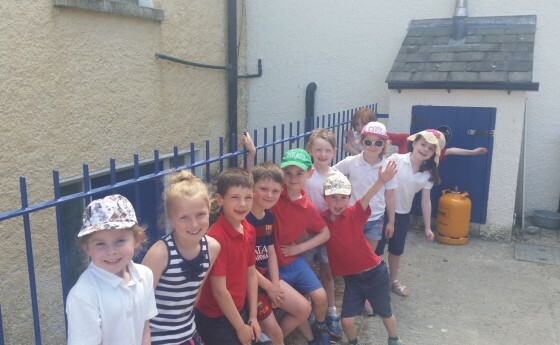 Second class enjoyed their nature walk. We went to the playground as well with múinteoir Laura and múinteoir Mary Jo. Chuaigh Rang a hAon chuig The Old Rectory i gCromadh. Bhí lá iontach againn, agus bhí an ghrian ag taitneamh an t-am ar fad! First class went on school tour to The Old Rectory in Croom. We had a great day, and the sun was shining the entire time!